NASA's Mars Exploration Rover Opportunity recorded this view of a crater informally named "Freedom 7." 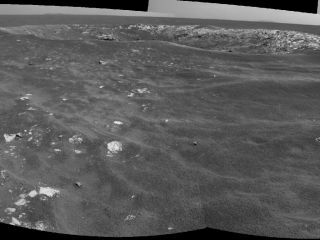 The image combines two frames that Opportunity took with its navigation camera on May 2, 2011. Mars researchers have informally named a crater on Mars "Freedom 7" to commemorate the Project Mercury spacecraft that first carried an American into space, which launched the historic May 5, 1961, spaceflight of astronaut Alan Shepard. "Many of the people currently involved with the robotic investigations of Mars were first inspired by the astronauts of the Mercury Project who paved the way for the exploration of our solar system," said Scott McLennan of the State University of New York at Stony Brook, part of the team of scientists controlling NASA's Opportunity rover on the Red Planet. The rover recently came upon a cluster of small, relatively young craters. The scientists decided to dub the largest of these Freedom 7. Coincidentally, the diameter of Freedom 7 crater, 82 feet (25 meters), matches the height of the Redstone rocket that boosted Shepard's spacecraft into suborbital flight. Scientists think the cluster that includes the Freedom 7 crater formed after sand ripples in the area last migrated about 200,000 years ago. "This cluster has about eight craters, and they're all the same age," said Matt Golombek, rover team member at NASA's Jet Propulsion Laboratory in Pasadena, Calif. "They're from an impactor that broke up in the atmosphere, which is quite common."